Immunogen: Synthetic peptide corresponding to amino acid residues 402-414 of human Herc5. 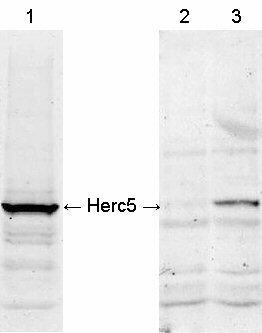 Crossreactivity: Does not cross-react with Herc6. Purity Detail: Partially purified by salt precipitation. Scientific Background: ISG15 is an interferon-induced and antiviral ubiquitin-like protein (Ubl). The ability of ISG15 to be conjugated to other proteins has been shown in some cases to be essential for its antiviral activity. Herc5 (HECT domain and RCC1-like domain-containing protein 5), the major E3 enzyme for ISG15, mediates the ISGylation of more than 300 proteins in interferon-stimulated cells. Herc5 is thought to broadly modify newly synthesized proteins in a co-translational manner, suggesting that, in the context of an interferon-stimulated cell, newly translated viral proteins may be primary targets of ISG15. The biochemical function of ISG15 conjugation and the basis of the antiviral activities of ISG15 conjugation have yet to be fully elucidated. Technical Info/Product Notes: BML-PW0920 has been characterized extensively by Western blotting of Herc5 transfected 293T cell lysate and IFN-stimulated 293T, HeLa and A549 cell lysates. Western blot detection of Herc5 in Herc5 transfected 293T cell lysate (1) and IFN stimulated 293T cell lysate (2: -IFN; 3: +IFN) using BML-PW0920 at 1:1000 dilution.